This is my favorite recipe for chiffon cakes, which have been tested and improved over the years in my kitchen. 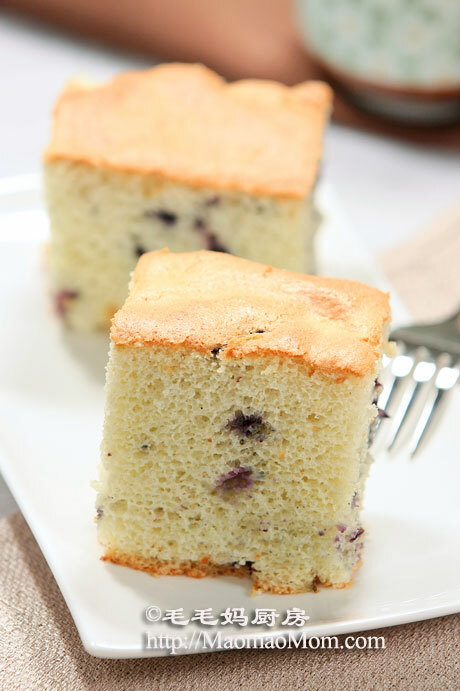 The cake is so light and moist with chopped blueberries, absolute delicious! 5: 1/3 cup blueberries, each cut into 4 pieces. 1: Separate eggs into two clean and dry mixing bowls. Add white vinegar to egg whites and beat with electric mixer on high speed until soft peaks form, then add ¼ cup sugar and continue beating until stiff (Picture 1), set aside. 2: Add 2 tbsp sugar to egg yolks and beat with same electric mixer on high speed for about 2 minutes (Picture 2), add 3 tbsp corn oil and beat for 1 minute. Add the rest of ingredients listed under Ingredient 3) and beat at low speed for 20 seconds. 3: Add flour and baking powder mixture in Ingredient 4) (Picture 3), beat at low speed for 1 minute, then switch to high speed for another minute. Add chopped blueberries (Picture 4) and mix well with a spatula. 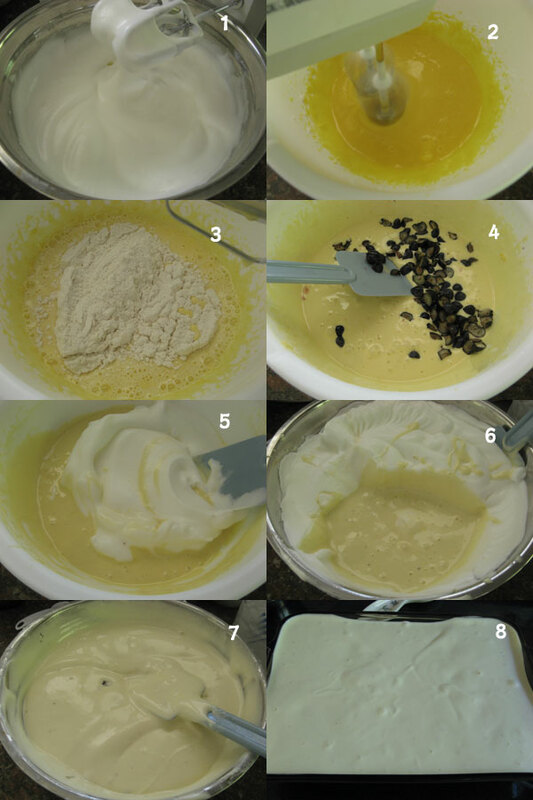 4: Add 1/3 beaten egg white into the egg yolks and flour mixture (Picture 5), mix well. Pour all egg yolk and flour mixture back into the remaining beaten egg whites (Picture 6), gently fold to mix evenly (Picture 7). 5: Pour batter into a 22×22 cm Pyrex baking dish (Picture 8) and smooth the top. 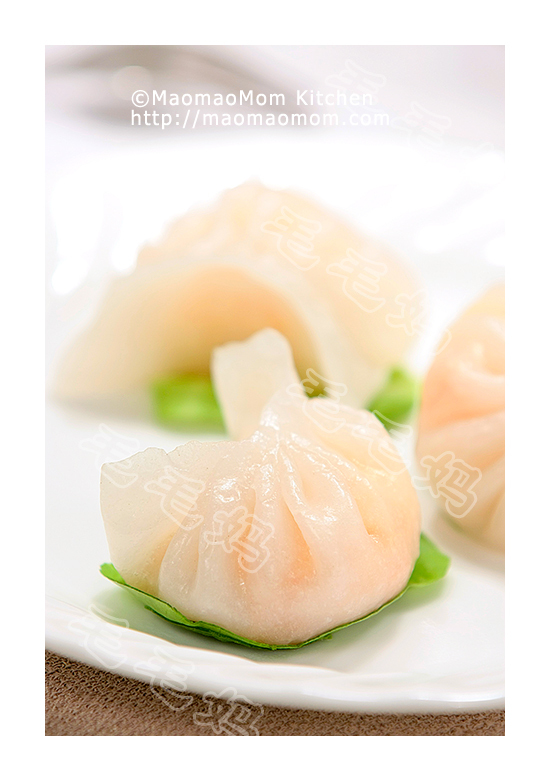 Bake in preheated oven at 340 F/170C for 37 minutes. 6: Take out the cake and cool upside down for 20 minutes. 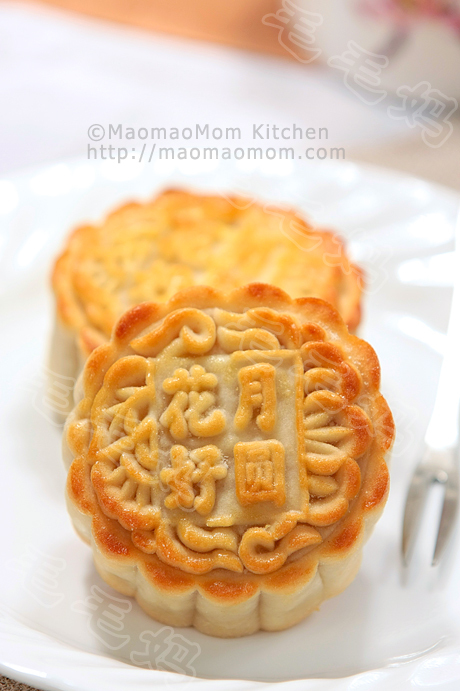 When cooled, use a knife to pry all sides loose and cut into 16 pieces. 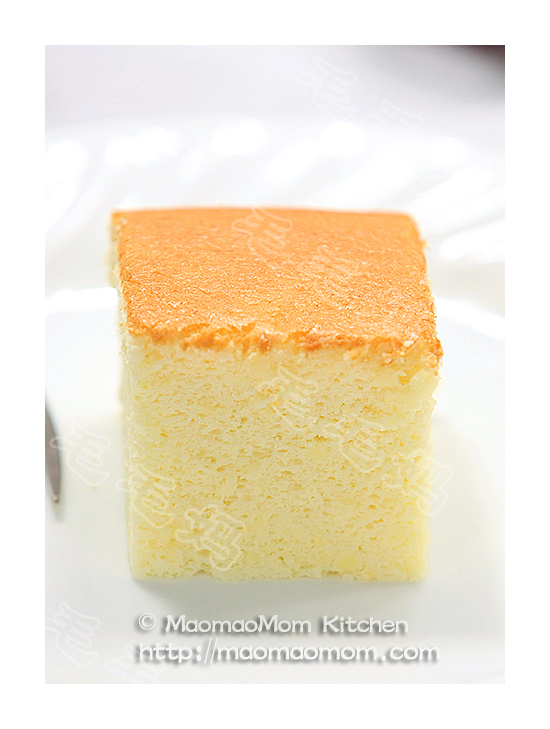 Store leftover cake in an airtight container at room temperature for 2 days or in fridge for up to 5 days. This entry was posted in Dessert, 甜点 and tagged Air Tight Container, Airtight Container, Baking Dish, Baking Powder, Beaten Egg Whites, Cake Flour, Chiffon Cakes, Cook Time, Corn Oil, Cup Blueberries, Cup Cake, Cup Sugar, Delicious Ingredients, Egg White, Egg Yolk, Egg Yolks, Electric Mixer, Flour Mixture, Mixing Bowls, Pastry Flour, Powder Mixture, Preheated Oven, Pyrex, Recipe For Chiffon Cake, White Vinegar. Bookmark the permalink. Why does the cake crack? Thanks very much. It was very delicious.